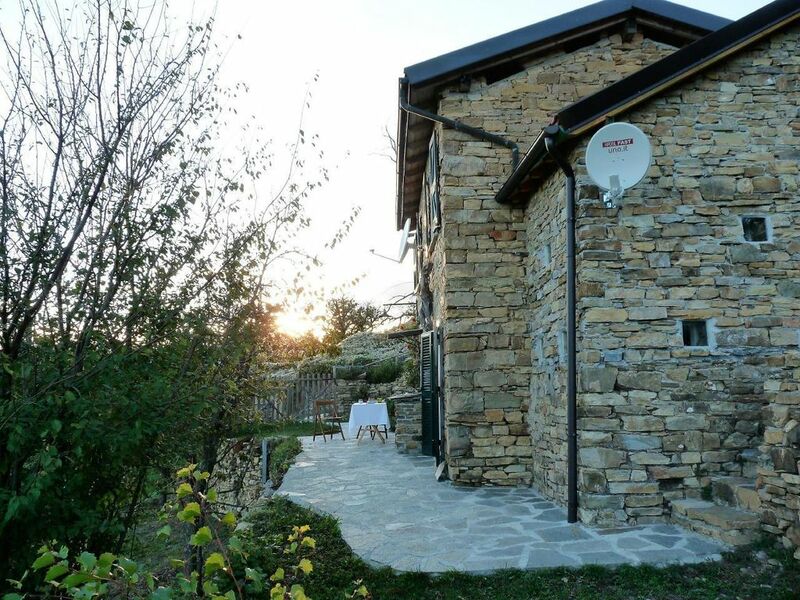 The Rustico CASA MONTE for 4-5 guests is located in Ciabaudo, a mountain village above Sanremo overlooking the sea (5km) and the Ligurian coast. The property is completely fenced, which is very convenient for a visit with a dog. In the house you will find two bedrooms and the bathroom on the upper floor, as well as the dining area and the kitchen on the ground floor. Bed linen, towels and tea towels currently have to be brought. The kitchen is fully equipped. In the shed there is a washing machine, an iron is also available. Nice, Monte Carlo & Imperia are a stone's throw away. For those who, despite the proximity to the hotspots of the area, are looking for peace and vision. The approach leads over a narrow mountain road to Ciabaudo, where you can park on the village square. If you drive a maneuverable car, you can also take the narrow bend behind the church and the last steep 200m directly to the house. Casa Monte is fantastically located in the Valle Argentina at about 800 m above the Ligurian Sea and thus about halfway to Monte Ceppo one of the highest elevations of Liguria at about 1600 m above sea level. From Arma the Taggia, directly on the sea, leads a winding but well-developed country road (SP548) into the Valle Argentina Valley, which rises steeply along its flanks, along the Taggia River in the direction of Triora. Shortly before the historic town of Badalucco, turn sharply left onto a pass road, which winds its way through dizzyingly narrow bends to the mountain village of Ciabaudo. Arriving at the village square offers the opportunity to park the car and the last 200m up to Casa Monte ascend. To the left of the church, a narrow and steep street leads to the house. Ambitious drivers with a suitable car (off-road vehicle or similar) can also dare to try and drive directly to the house. The area around Casa Monte offers the best conditions for hiking, climbing and bike tours. Immediately behind the house extends a spacious and natural mountain scenery, which invites you to long tours. Pet: per object and week Costs amounting to 20 EUR (optional).